Your home’s roof protects you, your family, and your entire house from nature’s elements. Like anything else, a roof requires regular care and maintenance in order to function properly and last as long as possible. 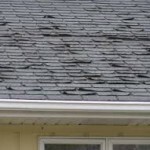 But wear and tear is inevitable, and even the best constructed roof will wear out eventually. Roof damage can be minimized through regular interior and exterior inspections to detect any minor problems. Homeowners should complete a roof inspection at least two times a year — spring and fall. It also is a good idea to check your roof after a bad wind storm or an unusually harsh winter storm. High winds can damage shingles, and large ice buildups can damage flashing and the roof membrane. And since some types of storm damage won’t show itself until the seasons change, regular inspections could reveal weather-related damage that wasn’t initially detected. Taking the time to do a thorough inspection on a regular basis will save you a lot of money in the long run. The best place to begin is inside your house in the attic. Using a flashlight, look for places where the roof deck is sagging. Check for any signs of water damage or leaks, and any outside light showing through the roof. When inspecting the exterior roof, pay attention to any damaged flashing, missing shingles, and shingles that are curling, blistering, buckling, or rotting. Always inspect under eaves and overhangs to look for damage that might indicate water leakage, especially at points of the roof that don’t conform to the regular roof plane, such as dormers or skylights. Not crazy about climbing a ladder onto your roof? Use binoculars instead to look for problem spots. Curling is a common problem and is usually a result of improper shingle storage before installation, incorrect installation, excessively dry asphalt shingle bases, poor quality materials, or just natural wear. When shingles curl, they are no longer able to keep water from seeping through your roof, which could potentially cause serious structural damage. Shingles only protect your roof if they are all intact. Missing shingles create convenient openings through which water can enter your home. Shingles can be pulled off your roof by strong winds or falling tree branches and can also be broken by repeated freezing and thawing. However, take special note if your shingles come off without any real reason – if this happens they are definitely worn out. All roofing materials will eventually deteriorate. 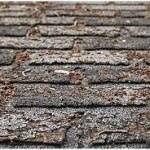 Often, shingles on a roof will not all go bad at once. Decaying shingles are fairly easy to notice. 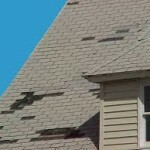 Look for splitting, cracking, chipping, peeling, curling, or blistering, and replace the affected shingles as necessary. 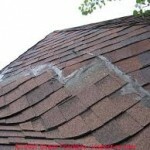 When moisture or gas builds up inside of a shingle, it can cause the surface to bubble outward, known as blistering. Conditions that cause blistering can include a poorly ventilated attic, leaf or debris buildup, or just natural roof aging. Intense sunlight exposure also can cause worsen a blistering problem. Flashing is a layer of metal sheeting installed at an angle or joint in your roof which prevents water from breaching the roof. The most common place to find flashing is around your chimney or sewer vent pipe. 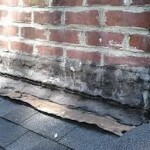 If your roof is rotting, the problem should be fairly obvious and must be addressed immediately. If some shingles are rotting, the rest could follow soon. 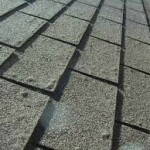 Rather than wasting time, energy and money replacing many individual shingles, you should bite the bullet and replace them all. Unfortunately, some roof problems are a result of poor craftsmanship. Telltale signs of poor-quality workmanship include obvious and excessive patching, shingles that don’t fit together or more than one layer of shingles. Years ago, it was common practice to install new shingles directly on top of the old ones to save money and time, but this practice is no longer acceptable and could void the warranty on your new shingles. Ultimately, a poorly installed roof will have a significantly shorter life and could even result in serious water damage to your home. No roof is going to last forever, and the biggest sign that it’s time to replace it is age. 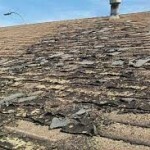 If your roof is more than 20 years old, it might be time to replace it. A healthy roof on your house is important – it keeps both you and your home safe. Regular inspections to watch for signs of wear or damage will let you take immediate action to repair minor issues before they turn into major problems. Do you have questions about the integrity of your roof? 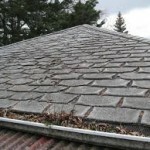 Perhaps it’s time you had a roof inspection or a roof replacement. The Chuba Company has installed more than 700 roofs using our dedicated and experienced crew of professional roofers. We also hold an A+ rating with the Better Business Bureau and are GAF Master Elite certified contractors, a distinction held by only 3% of all roofing contractors. And when you compare The Chuba Company’s warranty against the competition, you’ll see the difference. And don’t forget – Chuba gives a lifetime workmanship warranty on all exterior work. Give The Chuba Company a call today to schedule your FREE roof inspection and replacement estimate. Be sure to follow us on Facebook, Pinterest, and Houzz to see our quality project examples!